I've started a thread to capture all of the continuous negative publicity that the CBG injected into their publication. Hopefully, I have more accessible and time will allow me to scan it. Here is one such review by Don Thompson in CBG# 1055. I've edited out anything unrelated to Defiant. The negative media attention the CBG published was not limited to Don. It was evident in everything they published, even transcribed press releases. Typically, they were lazy asses that just reprinted whatever press releases were provided to them. They passed that off as comics journalism. The CBG consisted of a clique of contributors that simply banded together to pass off whatever agenda was in the hearts. Since some of them had negative experiences with Jim at some point in their careers, it became almost a collective smear campaign. It was at this point in my collective history that i lost all respect for the magazine. The icing on the cake was when Jack Kirby died. They had time to insert a full page ad from an advertiser on page#5 of CBG# 1060, but they didn't have time to mention it on the cover. 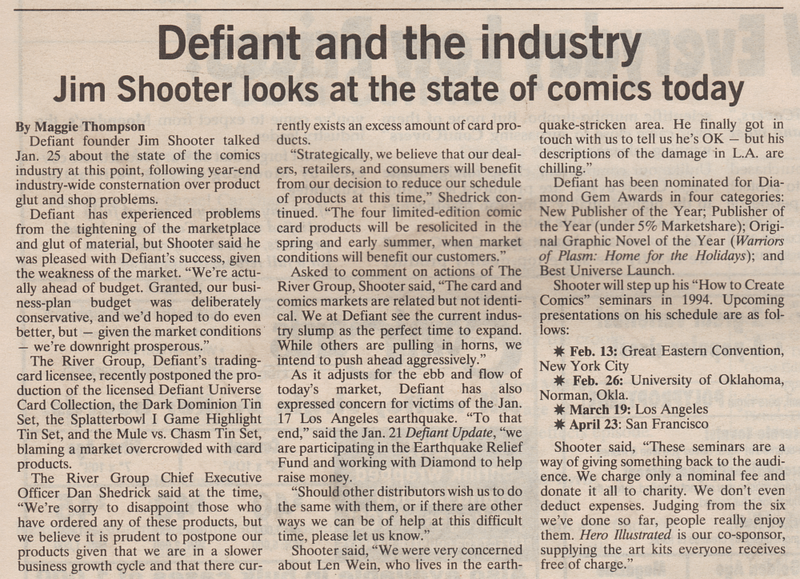 Instead, they ran a horrible image promoting a Rob Liefeld "event" in his comics called "Extreme Prejudice". That's ironic to me after all of these years. I now assert my firm belief that CBG simply used their cover as additional ad space. I'm never impressed with reviews that simply retell the story. A story summary is fine, but don't simply retell the story and pass that off as a review. Pass it off as a summary. This may be easier to read. Same content as above.. This is a flashback to the past. R.I.P. Len Wein. Earthquakes, fires. He dealt with it all. If it was the earthquake that hit during the baseball game, I remember all of that. 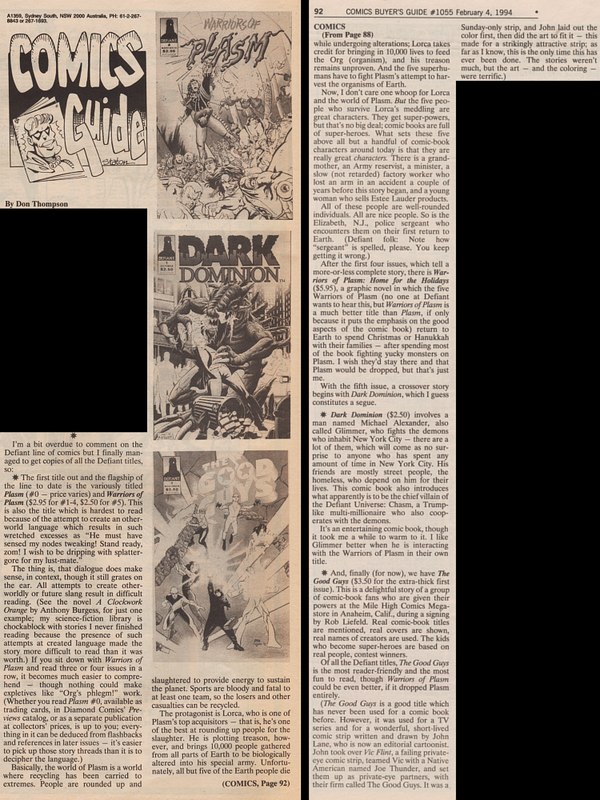 I've finally scanned an article with the seed of discord planted. 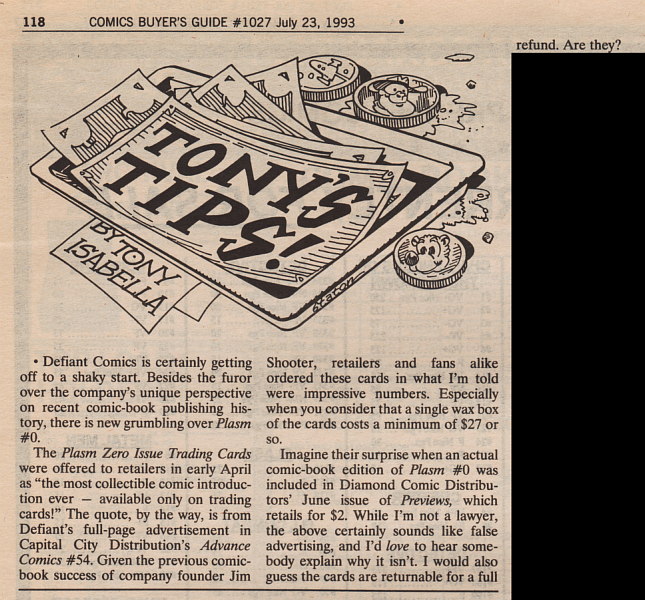 Rumor has it that Tony Isabella sought employment with DEFIANT and was turned down. This is an excerpt from his regular article and the DEFIANT comments were in the first slot for discussion. There was indeed some frustration with the 1st print card binders being produced in numbers too low (15,000 units). The frustration was that dealers were holding back inventory and gouging customers on price. There weren't a lot of complaints about the comic being bound into Previews. There were more complaints that you couldn't remove it from Previews without having glue stuck to the spine. This review sounds more like a passive-aggressive chip on Mr. Isabella's shoulder. He says "While I'm not a lawyer..." knowing that DEFIANT was in a lawsuit with Marvel. DEFIANT ultimately won that lawsuit, but Mr. Isabella was clearly stirring the pot of discord. He says it "certainly sounds like false advertising" to claim that it's the "most collectible". He puts out a disclaimer that he doesn't know from a legal perspective but he going to say it anyway. This is clearly the planting of a seed. You would not say that if your friend had made such a claim. You would take it as a subjective statement that can't be measured because the item was produced in limited numbers. Nothing about DEFIANT's claim can be taken literally. Even if you could take it literally, the demand far exceeded supply and it was highly collectible at the time of release. He doesn't stop there. He suggests that the product should be returnable, thereby financially hurting DEFIANT for making a subjective and figurative claim in their solicitation. He doesn't even stop there. He ends his review asking a question. The question encourages the reader to respond. Mr Isabella appears to want his audience to agree with him and speak up. This is my gripe with the CBG. It was a clique of creators that banded together to press forward with their collective agenda. They used their clout as a contributor to not dispense news, but instead to spread their personal agendas. I have never been a fan of Mr. Isabella. Articles such as this are just one reason added to a pre-existing list of reasons.